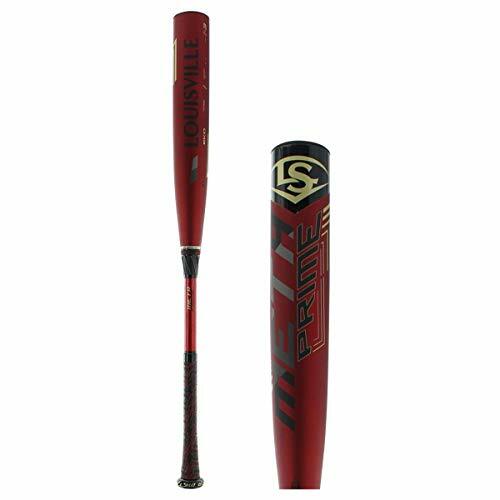 The 2019 Louisville Slugger Meta Prime BBCOR has now arrived, and it’s just in time for players to get used to for the upcoming season. The Louisville Slugger has always been an iconic brand, and baseball bats like this one justify this reputation. This is the most advanced baseball in the entire BBCOR lineup from Louisville Slugger, so you can be sure that you have the best baseball bat in your hands. Continue to find out why it’s #1 on my 2019 list of the 10 best BBCOR bats. It looks great. Sure, this may seem like an irrelevance. But BBCOR players are young men (and women) who appreciate style as well as substance. They want something that looks good enough so they also look good out there when they try to get a hit. The control is great. Even with the 34-inch length that provides the heaviest swing weight, you still have enough control and swing speed when you take a swing. This means that this is great for contact hitters, while even power hitters don’t have to sacrifice control for distance. The sweet spot is huge. This sweet spot is the barrel area where you want the ball to hit on the bat when you take a swing. This means you get maximum force on the ball, while at the same time the sweet spot is also the area that minimizes the vibrations traveling through to bat to beat up your hands. So you increase the chances of getting on base (or a home run) while you reduce the chances of getting your hands hurt. That’s a great deal. The power you get is also terrific, because the 3-piece design still has that “stiff” feel that makes the energy transfer better. The energy you generate when you swing hard at the ball is wholly passed on to the ball, so that the ball really gets out from your bat in a hurry. They’re not as easy to field. The new grip from Lizard Skin is also terrific. There’s no need to tape this to get a nicer feel for your hands. This new grip is so good that you’ll take it as it is. It’s very comfortable, so you’re not distracted when you contrite on the pitch as you swing. At the same time, you’re confident that the baseball bat won’t be flying from your hands as you take a swing or make contact. The tacky feel makes you confident. This is a player for all skill levels. If you’re a great baseball player, you need the best tools so you can maximize your talent and that’s what the 2019 Louisville Slugger Meta Prime BBCOR gives you. Yet if you’re more of an average player, it may not seem that way with this in your hands. It masks many weaknesses, so it makes you a better hitter. The price may be a problem for some people, since this bat isn’t exactly cheap. But then again, this is a premium brand and it is their flagship BBCOR baseball bat. With all these advanced features, you still get great value for your money. Because it’s very forgiving, the 2019 Louisville Slugger Meta Prime BBCOR baseball bat may not be the best bat to use for practice. That’s because it can mask a lot of mistakes. If you’re a baseball player and you want to improve your game, you need to practice with a more average baseball bat you recognize when you mishit a baseball. Here are the advanced features you get from the 2019 Louisville Slugger Meta Prime -3, which you may not see in any other bat in the industry. This comes in a -3 drop, available in a range from 32 inches (29 ounces) to 34 inches (31 ounces). The advanced EKO composite barrel with the Fused Carbon Structure gives you a great sound and a terrific feel. The design also has an extra half an inch for the length, which combined with the usual 2 5/8-inch diameter means you have a larger sweet spot to work with. The 2019 Louisville Slugger Meta Prime BBCOR comes in 3 pieces, and they come together through the 3FX Connection system. It’s well-known that many of the best BBCOR players prefer to have a stiffer connection so that the energy transfer is more efficient. This 3FX technology allows Louisville Slugger to fine-tune and tweak the inside and outside of the connection. This allows players to get that “stiff” feel when making contact without too much vibration either. This is the largest BBCOR barrel size from the brand, and it’s made possible by the RTX End Cap design. That isn’t literally true, as the barrel still measures 2 5/8 inches. But with the size of the sweet spot, it feels like the barrel is much bigger. You get a range of swing weights depending on the length of baseball bat you get. With the 32 and 33-inch, your swing weight is nicely balanced between control of the bat and distance of the hit. The 31-inch length offers more control and swing speed, while the 34-inch provides you with a bit more power and distance for your hits. There’s also the brand new Lizard Skin Pro Comfort grip, so you get the tack that keeps the baseball bat in your hands while you swing. You also get the cushion you need to keep your hands comfy. The new 2019 Louisville Slugger Meta Prime BBCOR is downright fantastic, which is actually unsurprising considering the brand reputation and the bat’s position as the best BBCOR bat in the Louisville Slugger collection. Nobody has anything negative to say about any of its features—it’s just that good. Whether you’re playing at elite levels or just starting out, this bat can help make sure you get the best results you can at the plate. Want this 2019 Meta Prime BBCOR with Free shipping?